Captain Rick Baker is your Fish Kodiak Adventures guide. Regarded as an uncanny “fish magnet” by the locals, he’s been fishing Alaska’s waters since 1979. Originally hailing from Oregon, it was fishing that brought him to Alaska and Kodiak Island. More than 30 years later, Captain Rick knows the Island’s fishing grounds like the back of his hand. He always finds the fish when others can’t. In 2010, Captain Rick was the Kodiak King Salmon Tournament winner and set an all time record for the derby with a 72.7 lb. 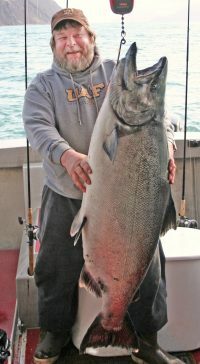 Ugak Bay King salmon. Operating the only fishing guide service in Pasagshak Bay, Captain Rick holds a U.S. Coast Guard 50 ton masters license and is fully insured. There’s no such thing as “slow fishing” when you’re aboard Captain Rick’s fishing vessel, the C Grace! “One week of fishing with Rick equals one year of good fish dinners at home. Rick is a real laid back guy, but don’t let that fool you. He has his clients best interests at heart at all times, and is dedicated to seeing that they will have a fishing vacation to long remember.” —Larry F.